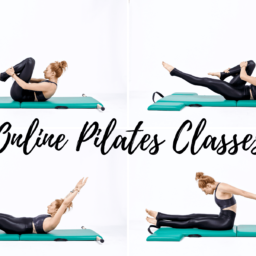 100 on the Mat is an all levels Pilates Exercise. If legs at the high diagonal is too hard, lift them higher. Or lower them towards the floor if too easy. Warning: If it bothers your lower back to lift your legs, leave them on the mat. The Hundred is an exercise designed to warm you up, get your blood pumping and connect your mind to your body and your Pilates practice. You can do this exercise at any level of your Pilates practice. Make it easier by keeping the legs down on the mat or harder by extending them out at a diagonal. Even hard lowering them to just a couple inches off your mat. Wherever your body is that day and where you are in your Pilates practice will determine this. Use the Hundred to warm up and get ready! Wrap your outer thighs around and feel your glutes help support your legs and connect them to your center. Lying on your back, arms reaching overhead and legs long on the floor. Take an inhale here and then with your exhale curl your head, shoulders, and legs off the floor. Reach your arms across the room and long by your side at the level of your hips. Inhale as you pump your arms vigorously for 5 pumps and exhale for 5 pumps. Repeat 10x. Once finished, stretch your body across the room and lower everything down simultaneously. Remember, your goal here is to warm up, connect to your center and feel where your body is at the beginning of your mat workout. From the 100 you will go right into the Roll Up. Think about lengthening out through your lower back and getting as long in your spine as you can. You want to also, hug your legs as tight together and feel the pump of your arms from your back. Your arms are like wings! The more you pump from your back the more you'll be able to reach from your back in the rest of your mat workout. Don't forget you can always leave the legs down on the mat if your stomach and seat are not ready to lift them off the ground against gravity. One day, they will lift on their own!